The 2016 Centennial gold coins, also widely known as 2016 Liberty Centennial gold coins or 2016 Liberty 100th Anniversary gold coins, were released to honor the 100th anniversary of three beloved circulating silver coins that were originally issued in 1916. 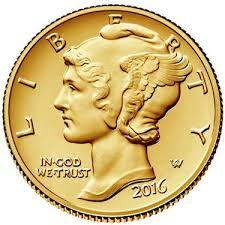 Those three silver coins include the Mercury dime, Standing Liberty quarter, and Walking Liberty half dollar. The gold coins that were released in 2016 offer faithful reproductions of the famous designs by Adolph A. Weinman and Hermon A. MacNeil. Weinman’s designs include the Winged Liberty (“Mercury”) dime and Walking Liberty half dollar, while MacNeil’s contribution includes the Standing Liberty quarter. The three designs were honored on gold coins that approximate the physical diameters and thicknesses of the original dime, quarter, and half dollar. The three gold coins were issued with nominal face values of 10 cents, 25 cents, and 50 cents and were struck in denominationally symbolic fractional weights of a tenth ounce, quarter ounce, and a half ounce, respectively. While the designs are virtually identical replications of the original, some small tweaks were made, including the addition of a tiny inscription declaring the gold content within each coin.